"Ooga Booga follows an innocent African-American boy who is brutally murdered by dirty cops, but his soul is magically transferred into an action figure named Ooga Booga. With his tribal spear and old girlfriend to help, he takes to the streets and trailer parks to find the men that ended his once bright future." 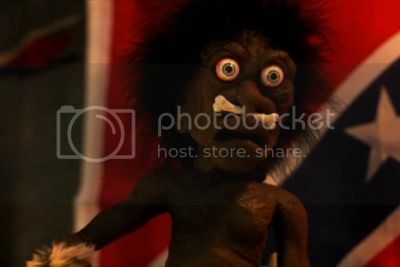 Having seen Ooga Booga's other appearances in "Doll Graveyard" (2005) and "Evil Bong" (2005), I was intrigued by what Charles Band had in store for us with a full length feature starring the puppet. I also wanted to see if Karen Black and Stacy Keach could still act since I haven't seen them in anything horror related for ages, but that's another story. It's been a long time since "Trilogy of Terror" (1975) or "Body Bags" (1993) which are, respectively, their most famous genre performances. I know that I have a reputation for being all about the serious horror movies rather than the comedies, but before everyone jumps on the "You're a hypocrite!" bandwagon, I do watch other subgenres occasionally either by accident or just to see what's happening. I may be a hypocrite in some situations (like everyone else), but I'm not as bad as certain sycophantic "big name" websites or virtually deceased hillbilly podcasts. This isn't a popularity contest for me so if I choose to watch something silly rather than horror from time to time, that's my business which I'm now making yours for the sake of a blog post. Anyway, with no idea what kind of entertainment I was going to derive from "Ooga Booga", I gave the Redbox kiosk my custom, made yet another pizza, and settled down for something a bit more uplifting than all the usual death... or so I thought. There's actually still a little bit of murder and bloodshed in "Ooga Booga". Although the cynic in me is inclined to believe that the whole movie is a giant advertisment to sell replicas of the "Badass Dolls" because they're undeniably cool, "Ooga Booga" has a few genuinely funny moments in spite of itself. Unfortunately, the pacing is slow and the jokes are very far between. Nobody does a particularly bad job, and the Ooga Booga doll is cute enough to steal the show in every scene even if he's only blinking, but everything feels sparse. The movie isn't short of racist insults, but many punches are pulled by the lack of real vehemence behind them which would make everything more offensive, controversial and memorable. The main gag is, obviously, the homage to Karen Black's fight with a Zuni fetish doll in "Trilogy of Terror", but it doesn't have any impact even with the same actress in it. Making a parody out of something that was already unintentionally funny is a misplaced step too far in the "meta" direction, and it falls flat. The motivation of the Zuni fetish doll is completely different to Ooga Booga's revenge for one thing. I must admit that I was expecting (and hoping for) "Ooga Booga" to be a lot more racist and un-politically correct than it turned out to be. While the racist epithets and imagery abound, the fun is really poked at the white stereotypes more than cashing-in on the "blaxploitation" angle. As such, I'm not really sure what to make of what I watched. The bottom line is that "Ooga Booga" is neither pro-Black or pro-White even if the characters are one way or another. As a bit of cheap "filler" entertainment which lasts less than 90 minutes and only costs a dollar, there's nothing much to gain or lose from the experience. Are you looking for something scary to watch? It's on here somewhere. I'm a grumpy Brit who loves watching horror films late at night with two cats for company. I write honest, mostly objective movie reviews, retrospectives, and recommendations punctuated by anything else that takes my fancy. My ongoing mission is to seek out only the best horror films ever made. I do not and will never support or encourage no-budget, backyard epics, horror-comedies, or intentionally badly made horror films. Screeners or movie passes will not guarantee a good review. Rights to any movie logos, photographs, screencaps, posters and/or videos used on this site belong to my affiliates and the respective motion picture studios. No infringement of these rights is inferred or suggested. This is NOT a popularity contest! PUNISHER: THE NETFLIX SERIES is very "Bourne-ing." Here's What You Had to Know About Cryptocurrency. The great VHS Haul of 2016. Blogo Trasho returns to normal.... In July. My Insane Emporium of B-Movie Madness. Copyright © Dr Blood, 1997 - present. Powered by Blogger.